Description: Are the Synoptic Gospels at odds with Early Christian art and archaeology? Art and archaeology cannot provide the material basis 'to secure the irrefutable inner continuity' of the Christian beginnings (Erich Dinkler); can the Synoptic Gospels step in? Their narratives, however, are as absent from the first hundred and fourty years of early Christianity as are their visual imageries. 'Many of the dates confidently assigned by modern experts to the New Testament documents', especially the Gospels, rest 'on presuppositions rather than facts' (J.A.T. Robinson, 1976). The present volume is the first systematic study of all available early evidence that we have about the first witness to our Gospel narratives, Marcion of Sinope. 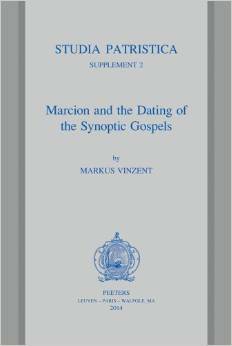 It evaluates our commonly known arguments for dating the Synoptic Gospels, elaborates on Marcion's crucial role in the Gospel making and argues for a re-dating of the Gospels to the years between 138 and 144 CE. Citation: Clare K. Rothschild, review of Marcus Vincent, Marcion and the Dating of the Synoptic Gospels, Review of Biblical Literature [http://www.bookreviews.org] (2016).